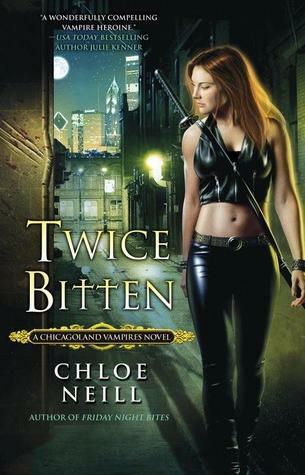 After zooming through Some Girls Bite and Friday Night Bites, the first two books in Chloe Neill's Chicagoland Vampires Series, I was extremely eager to sink my teeth into Twice Bitten. Twice Bitten starts off a week after the second book ended. Merit has become more adjusted to life inside the Cadogan House and is still on the outs with Mallory. They make up about halfway through the book, which, unfortunately means that we see less of Mallory,and therefore Catcher throughout it. I was extremely disappointed by this because I not only love the Merit/Mallory friendship, but I just adore Catcher and Mallory as characters. We also see less of Merit's Grandfather and the rest of this gang. Jeff makes a few appearances, but not nearly as many as I would have liked. We are however given some wonderful time with my three favorite blonde vampires; Lindsey, Luc and Ethan. Now that Merit is living in the house she spends a lot more time with all three of these awesome characters, which is fine by me. I especially love Lindsey's character. She is sarcastic and witty and is a great friend to Merit. I am hoping that in book four, Hard Bitten, that we will be treated to some Lindsey/Merit/Mallory scenes. Wouldn't that be great? The three of them together would be a killer combination. And, of course, I love Ethan. This book, thankfully, heavily deals with the Merit/Ethan relationship. I don't want to give away too much for those of you who haven't read it yet, but you will be treated to some fabulous scenes. Merit tends to bring out a different Ethan and he starts to really open up. He is however, Ethan. Which means he pulls some really dumb moves - but what else can we expect? The plot of this book deals with the rising tension of the shapeshifters. Gabriel, the pack alpha, calls a meeting in Chicago for the pack to decide what to do next about the "upcoming war". They have two choices: go hide out in Alaska or stay and fight it out. He recruits Ethan and Merit to act as security guards for the meeting and to help show the pack what is at stake. At the first meeting (one between the head hanchos), Merit saves a by-standing shifter by taking a bullet for her. This creates a gateway for the rocky relationship between the shifters and the vamps. It is Ethan's hope that the Cadogan House can now form some kind of an alliance with the shifters. As you can see, once again the plot is absolutley addicting. 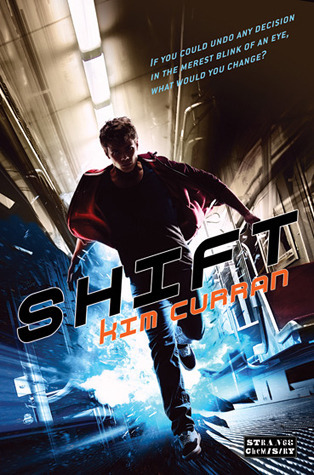 The pacing is perfect and we get to explore a world in which we haven't seen much of yet; the shapeshifters world. Once again, Neill hit this one out of the park. The characters and their relationships between one another are all developing wonderfully, the plot was interesting and unique enough to keep you pulled in. My only problem with the book was the serious lack of Mallory and Catcher. What was my favorite part of the book you ask? Easy, three words - "you undo me". Anyways, as you can tell, I loved Twice Bitten; it is a great addition to the series. If you haven't read these books yet, I highly recommend them and you should do whatever is in your power to remedy your situation. *one last thing, what is up with the new Merit on the cover? I wish they would have kept the old Model, the new one does not look like the Merit I pictured - I mean, come on, that girl is a redhead. I really, really need to read this series! Thanks for the lovely review! It's the best I've read of this book! !